Want to impress your potential employer? Mechanical Engineer Resume Template is your match for an impeccable presentation of your candidacy. Its elegant look will catch attention at a glance. Carefully built layout includes all the needed blocks for you to describe yourself in detail. 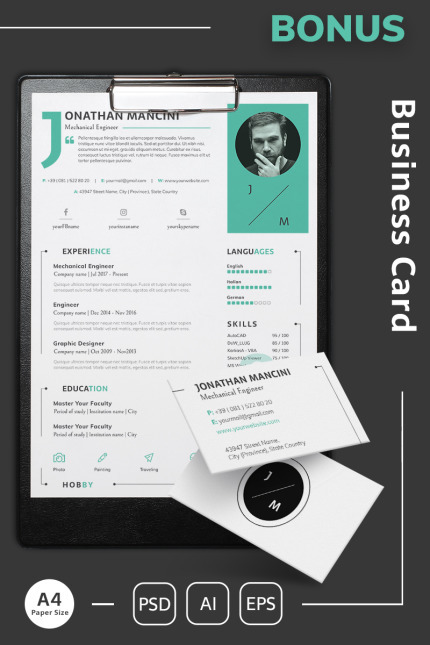 This moderate template is supplied with business card bonus, so you will be able to create a marvelous first impression of your personality. It’s soothing white and turquoise color scheme will appeal to each and everyone, plus will prove you to be a serious job seeker. In case you don’t like the default design of this template, you can change color easily in PSD, AI, and EPS. Thanks to the use of free Google fonts, such as Sarala, Bellefair, and Muli, you will be able to explain your professional potential to the full without any additional worries. Choose Mechanical Engineer Resume Template to be noticed by the HR of your choice.